Evaluation modules & Sockets etc. Smaller, with significantly reduced power consumption. The history of gas sensor development has frequently focused on miniaturization and reduced power consumption. Figaro Engineering has succeeded in development of the TGS8100 MEMS semiconductor gas sensor, boasting a size and power consumption among the lowest in the world which in turn simplify product design and enhance automated manufacturing. The needs of the market are changing dramatically. Gas sensor applications are not just limited to gas alarms for safety and security, they also address comfort and increasingly appear in devices useful in building a sustainable society. 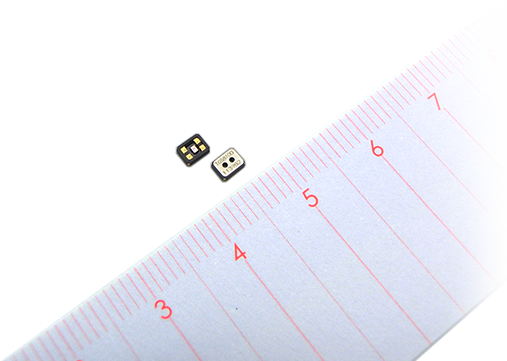 The TGS8100 is characterized by dramatic miniaturization and low power consumption achieved through leading-edge MEMS technology. This advancement now permits incorporation of gas sensors in small devices and application of gas sensor technology in networks connected by information communications technology such as wireless services. devices and application to mobile terminals and wearable devices. 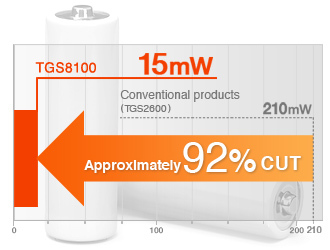 At 15mW of constant powering, power consumption is reduced by approximately 92% in comparison to conventional products. While miniaturization may raise concerns about reliability of gas sensors, TGS8100 maintains chemical stability via special MEMS manufacturing techniques combined with Figaro’s extensive expertise in sensor materials. Furthermore, the potential for intermittent drive allows for the possibility of battery operation, permitting use in devices and equipment not previously possible. When intermittently powered, the gas sensor reaches heater ON temperature in just a few seconds, enabling rapid gas detection. While intermittent drive raises concerns over the adverse effects of thermal shock on sensor structure, the unique design of TGS8100 minimizes these effects. While the large heat output of conventional gas sensors causes heating of the sensor’s package surface, the TGS8100 is a negligible heat source when mounted inside a device. Electronic components and actuators in the vicinity of the sensor are therefore unaffected and the design of devices employing temperature and humidity sensors need not consider the sensor’s effect on internal heating, greatly simplifying product design. The TGS8100 comes in a standard Surface Mount Device (SMD) package suitable for automated mounting and reflow soldering. The sensor is designed for factory automation in mass production for the international market and is shipped on reels. To optimize comfort for consumers, air quality sensors are used widely in automatic controls in applications such as air cleaners, air conditioners, and domestic and office ventilation fans. The TGS8100 MEMS air quality sensor is smaller and brings lower power consumption than previous devices, and is expected to find application in mobile equipment such as smart phones and wearable devices, and in various M2M devices such as environmental monitors and monitoring robots. Many devices incorporating air quality sensors also have a very promising future in the Internet of Things by connecting to HEMS, BEMS, and FEMS networks. Copyright © 2018 Figaro Engineering Inc.